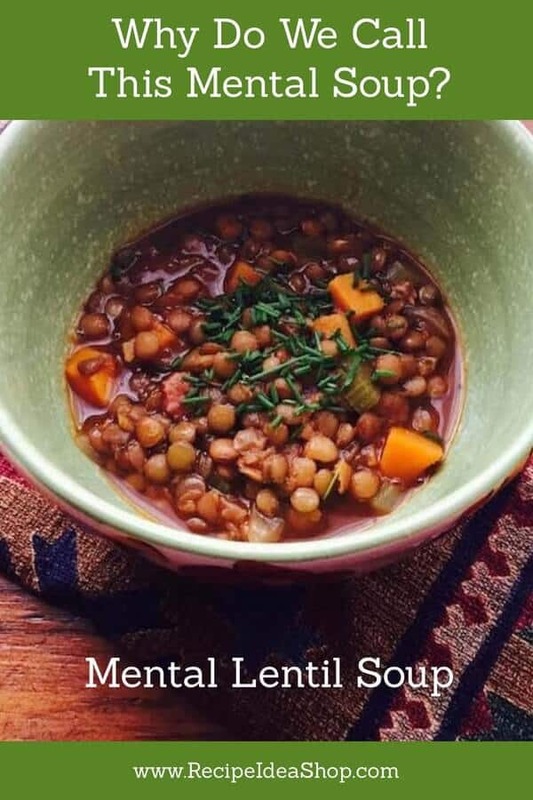 Mental Lentil Soup. A silly name, but a hearty, tasty meal. 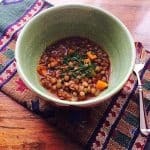 Lentil Soup (or Mental Lentil Soup as our kids called it). Robust. Delicious. Hi. It’s Lois at Recipe Idea Shop, discussing a good, hearty soup, Mental Lentil Soup. 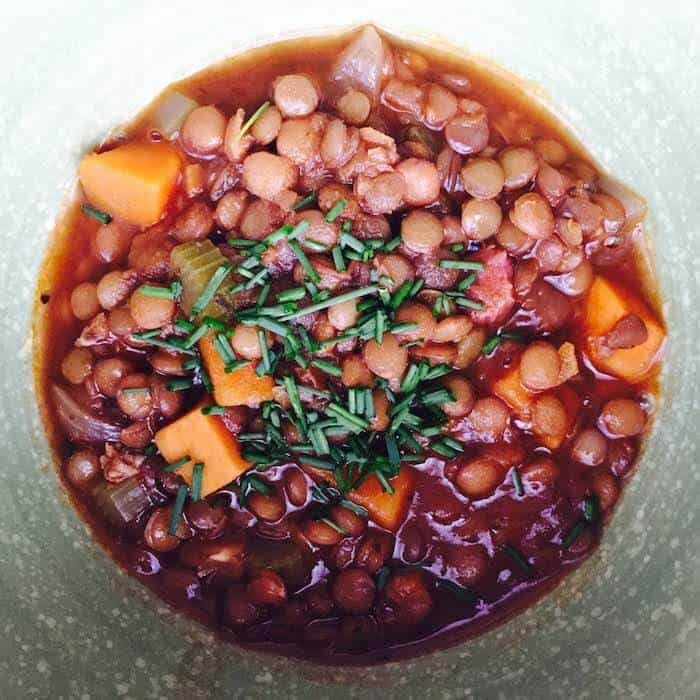 It’s robust and scrumptious.Why do I call it “Mental” Lentil Soup? When our younger daughters were growing up, they were not fond of trying new foods. Don and I both love Lentil Soup, but Roni and Nessa did not like it. They called it Mental Soup and occasionally managed to choke a bit down. 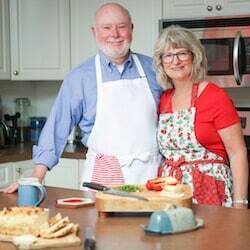 Don made a variation of this soup for dinner on Saturday night. Thanks, Don! Not only did we have a delicious meal, but I have lunch for a couple days this week. 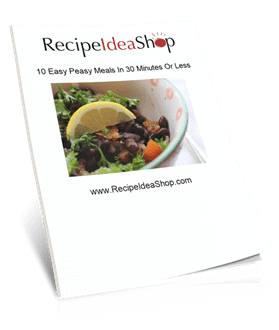 You can easily change the whole flavor of it by adding a ham bone or a few different spices. If you like a spicy soup, you can add turmeric, cumin, cinnamon and roasted red peppers for an entirely different flavor. Serve with Crusty French Bread or a grilled cheese sandwich and a salad for a flavorful peasant supper. I generally add a little bit of vinegar to my soup when I eat it. The vinegar gives it a tangy flavor. Le Creuset Signature Enameled Cast-Iron 7-1/4-Quart Round French (Dutch) Oven, Marseille. Buy it on Amazon today. In a large pot, sauté the onions and carrots in the olive oil until the onions are transparent. Add water, lentils, bouillon and spices and cook for about 30 minutes until lentils are tender but not mushy. Skim off the foam as it comes to the surface and stir the soup occasionally as you cook it. Add the tomato paste and simmer for another 10-15 minutes. Mental Lentil Soup Nutrition Label. Each serving is about 1-1/2 cup.